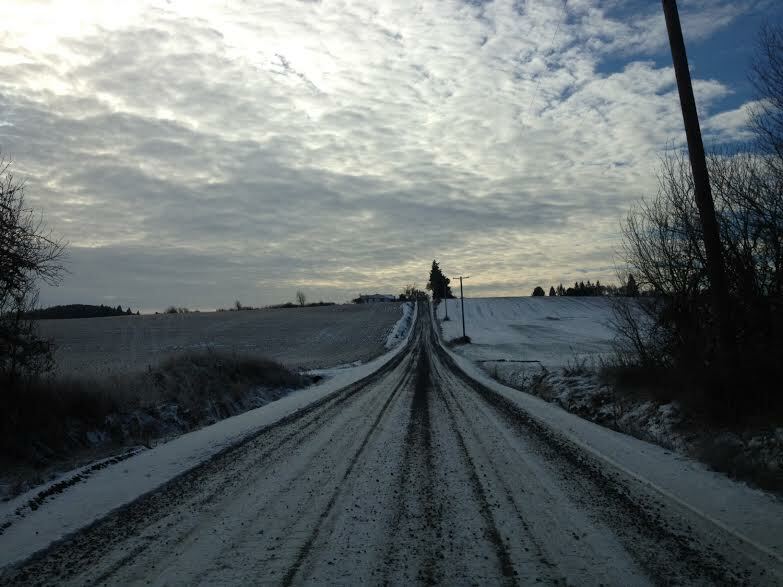 A forbidding winter landscape on our road on a bleak December morning. Bitter. Miserable. Stinging. Stark. Bleak. Hard-Scrabble. These are not adjectives we are used to here. When I think of winter here I think mild, damp, raw, drippy, muddy. 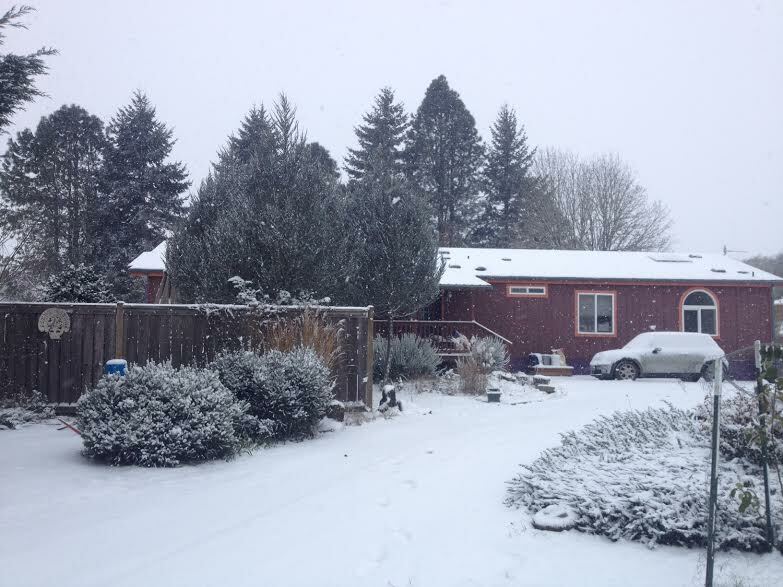 The concerns we have in the Willamette Valley for winter are not those that the denizens of the Midwest or Northeast have. We don’t need to worry about water for our animals freezing. The olive, fig, and apricot trees are more in peril from damp and over-wintering critters and fungus than from extreme cold temps. Some animals will protest at the mud but still head outside for food and water. The fuschias might peak out from under a heavy wet snow that will fall in the morning and melt by afternoon. 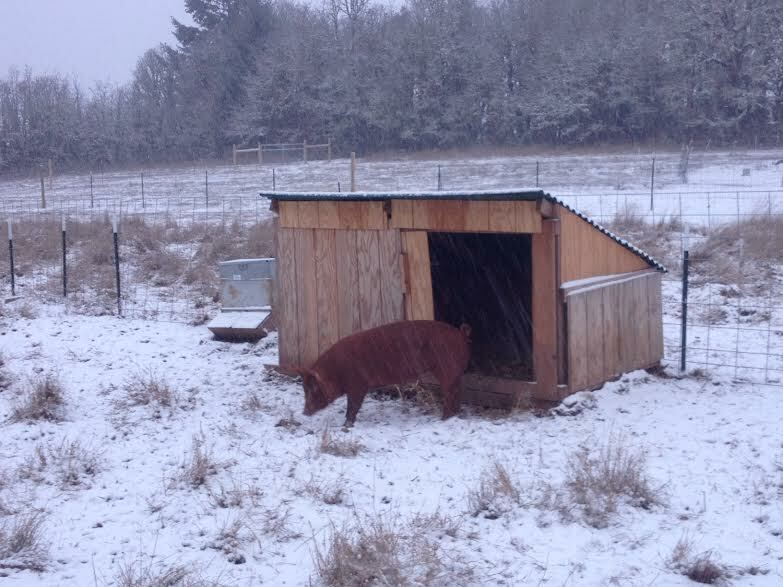 Titus Pullo makes a dash across the snow for food and warmth at the neighboring coop. Not this December. A bitter cold has us in its icy grip. Last night the thermometer hit 8 degrees. As I write it is 12 degrees. The region has seen nothing like these temps since 1972, the year a big blizzard came in around the 9th of December, causing massive power-outages and stranding my parents in downtown Portland for the night. The snow that fell on Friday was not the heavy wet variety we are used to; it reminded me of nothing, if not the fluffy, dry powder that used to fall during New England winters, when moist air followed bitter artic blasts; both the snow and the cold have persisted, and, in fact, the lingering snow has depressed temperatures here. We have been in the teens or below going on about five nights now, and it has made life unexpectedly rough here, with some attendant worries. First, water: after several days of highs in the 20s every tank on the property that had water is frozen solid. As I said, this is not the Midwest, so heated water tanks for animals such as one finds in, say, Montana or the Dakotas make no sense here, until this week. Thankfully our largest water consumers, the broilers and turkeys, are gone; but we still need to haul about 25 gallons of hot water two or three times a day from the house to the animals, and there is simply no easy way to do it. We take water from the bathtub and then lug it by hand to the pasture right now. By afternoon there’s a layer of ice, so we’ve taken to doing afternoon chores with a mallet in hand to break it up. Friday, December 6, at 9:30 AM; the glow in the coop is the heat lamp we installed for our layers, not that it’s done much good! So far the animals have weathered the freezing temps, but our layers are completely off; for one flock at least we were able to run a cord out to their coop and install a heat lamp. The other flocks are more crowded and so stay warm just from body temp alone. When we first had snow a few days ago none of the flocks showed any interest in coming out, but after a day or two they got used to the white stuff and emerged from their coops – still on the whole they seem to prefer to hunker down inside. The pigs, who are in an open four sided shelter with an open door, have rarely come out except for the goats milk they get morning and evening; they prefer to just hunker down in their straw next to each other and stay warm. The goats we have kept in the barn for their own safety and protection. Being outside in this chill is pretty exhausting, and causes one to build up an enormous appetite. It’s especially hard on the fingers and hands when milking, because there’s really no way to do the task properly with gloves, so needs to be done bare-handed. Handling metal buckets and glass jars is a particularly unpleasant experience. All one wants to do after morning chores is to sit under a blanket and drink hot coffee by a fire. But we have responsibilities, because the animals must be tended; moreover at these temps, as we have found, if you don’t check for eggs every couple of hours (well, what few there are!) they freeze and crack; you need to make sure the animals have plenty of food and water to help them maintain body heat. The hogs have added some heft, and helped to give them some decent protection from the cold; thankfully, there has been no wind with the chill. While animals are a concern for us right now, later it will be freeze damage to fruit trees and the garden. Based on normal conditions I had put in, for winter greens, lettuce, spinach, beets, broccoli, and chard (all in raised beds under cover); and I had been lazy about harvesting our leeks because, well, winters are mild – they should last in the ground until spring. Now even the winter crops under cover are pretty frozen and stressed, if not dead. I am just holding my breath for our apricots, peach trees, paw-paws, figs, and our stalwart and thriving olive tree. We’ll have no idea how they fared until spring. As for the greens, I will likely need to replant them when rain and 40 degree temps come sometime later in the week. The house at 9:30 AM, Friday, December 6. 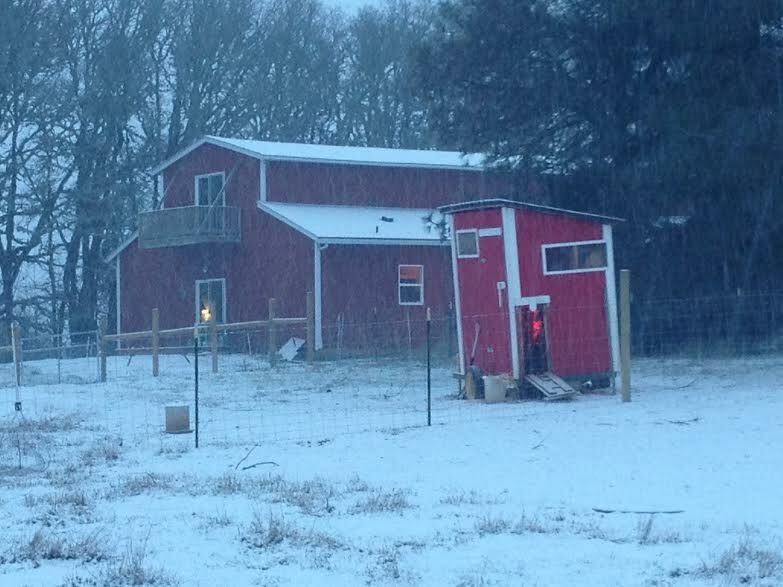 For all that, we have managed to get some work done inside, working on an official farm office in our big red barn, and finishing up the shelter for our bucks. Although I must say, spending late yesterday afternoon on a ladder securing the roof on the shelter was not entirely pleasant, given the 20 degree weather; for all that, the sheer physical activity of moving lumber, roofing, and construction equipment kept us warm. And, when the warm weather returns (meaning at this point 40 degrees or better), we’ll be ready to send our bucks out to their corral, and be done tormenting them, us, and the girls with confinement in our animal shed. 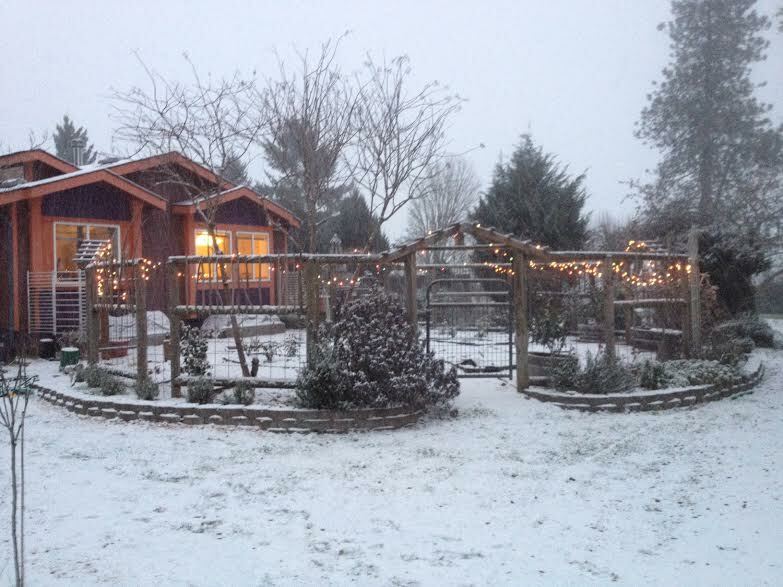 The circle garden at 4:00 PM December 6. 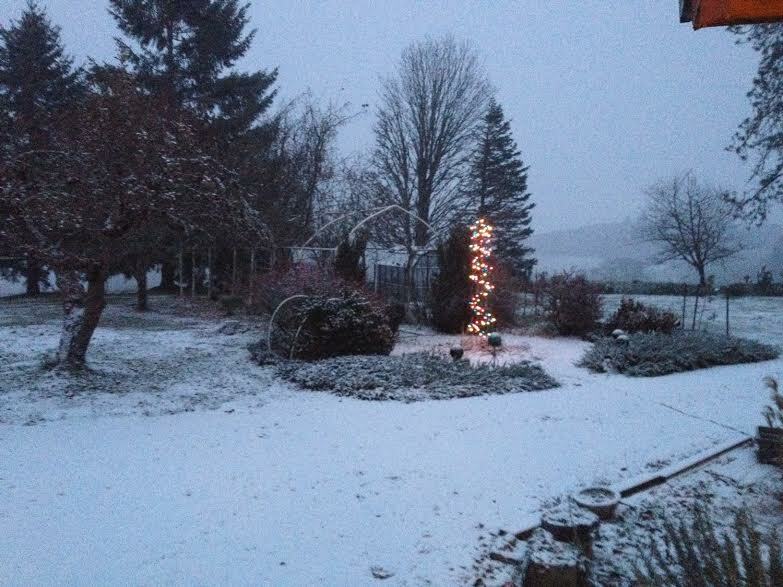 The grounds on the front of the farm, 4:00ish, Friday, December 6th. In the midst of all this I wonder how people dealt with this in antiquity. I know that in the Middle Ages German farm houses, even farm houses in the mountains of Italy, would have the stable below the farm house, so that farmer and animal lived in the same building, as a conservation measure for heat. But I wonder still about water sources for them; we hear that in the winter even the Rhine could freeze, in a tough year. So running streams were likely not an option for them. I’m guessing they heated water somehow, or just let the animal fend for itself, although for dairy animals that would seriously depress milk production. Yet as I wonder about this I certainly don’t envy the ancients at the moment either their lack of forced air heating, or coffee. 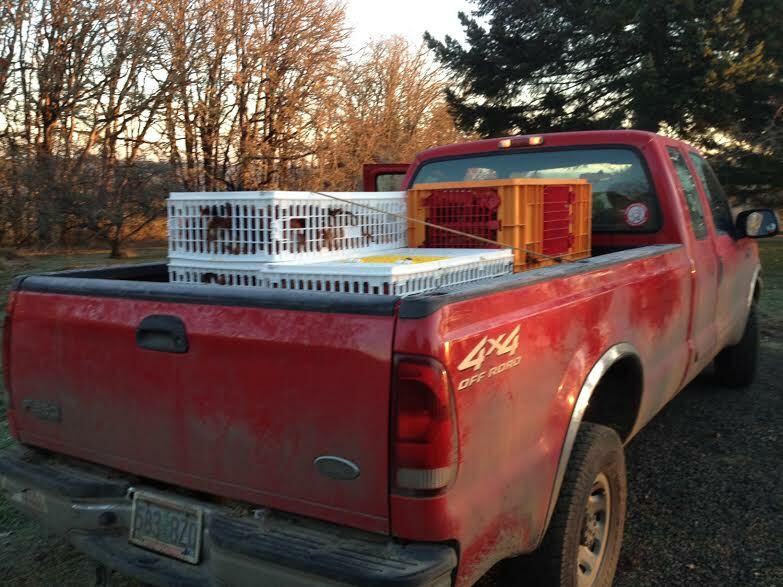 The truck warms up in the morning chill with a load of chickens destined for the dinner table. They were all Red Rangers which are good foragers, beautiful birds to look at, and with outstanding meat. Normally the school year presages the end of summer, when temperatures can still hit the 80s, vegetation is still verdant, and tomatoes have yet to ripen. But for us the end of summer has arrived on a day in which the frost never left the shady spots on our property, the air temperature never got much above freezing, and the predawn sky held a million stars that glistened a steel cold silver above us. This morning, at 7:09 am to be precise, we harvested the last of our pastured chickens that first hit the pasture back in September in what was still the heat of summer. The day started for Lori and myself at 3:00 am, getting stoked up with hot coffee for a couple of hours in order to face the task at hand. We showered, ate a small breakfast, and at 5:46 am headed outside to our pasture. It was pitch black, the air was icy cold and raw, and every breath you exhaled was visible in the night chill. Nancy soon joined us. We had stacked the cages the night before, so we first positioned them inside the enclosure containing the birds. Lori and Nancy harvested the birds, I manned the cages opening the doors and wielding the flashlight for them. It took approximately one hour to load up 94 birds into seven plastic cages plus a dog kennel. Kudos to the ladies who are adepts at chicken harvesting, and have muddy, well-manured knees to prove it. When we finished there was the first advent of dawn; hints of orange filled the east, Mount Hood was in its normal stunning winter silhouette, and frost coated even my woolen cap. I backed the pickup truck onto the pasture, we heaved the cages onto the bed of the truck, then parked it on our driveway. We had just enough time to do a few chores and then it was off to Mineral Springs to have our birds processed. While there waiting, as usual, I met some great, like-minded people. This time is was Bob, a former electrical engineer who now farms, among other things, ducks at The Old Strawberry Farm in Tidewater. After passing the time chatting with Bob our chickens were unloaded, I took the cages back home, picked up Nancy, the coolers, and some cash, and headed back to the processor to pick up our birds. Nancy weighed and labeled each individual bird as I brought them to the table then put them in the coolers. Our total weight came in at just under 450 lbs of chicken, with 94 chickens; th average was just around 4.75 lbs which is pretty respectable for pasture raised hens and roosters (and I suspect most of our flock were roosters). Some we will sell, some we will eat ourselves, and some we will donate to a local food pantry. 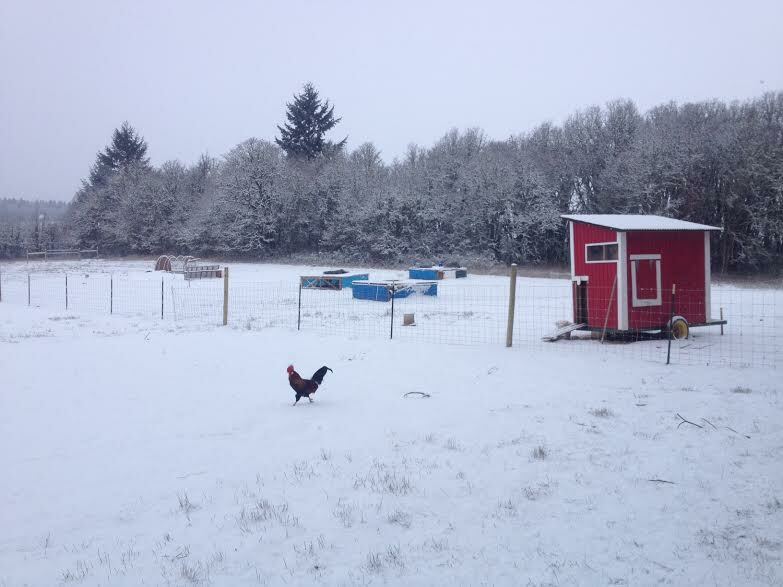 The chickens are now in deep freeze, and so are we this 18 degree morning. We have ended the summer, and suddenly find ourselves in the season of lights, carols, and festivities. Not a bad way to enjoy a brief respite, until it all starts up again in February. Jane La Lone on Oh Krito . . .
Steve B on Light Blogging . . .